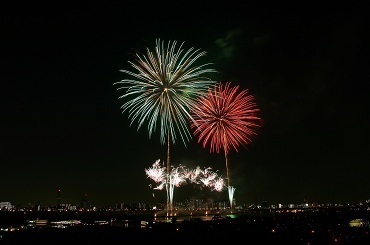 The annual fireworks festival was held at two sites along the Sumida River from 7:00 p.m. to 8:30 p.m. on July 31th. Approximately 20,000 fireworks were set off. The festival dates back to 1733, when approximately 20 fireworks were set off over the Sumida River around Ryogoku to mark the start of the river leisure such as swimming, fishing and boating on the 28th day of the 5th month according to the lunar calendar(July 9th in the Gregorian calendar). From the 28th day of the 5th month to the 28th day of the 8th month in the lunar calendar every year, eating and drinking establishments and amusement facilities around Ryogoku were allowd to be open till late at night(normally open to sunset). So commoners could eat fresh fish tempura, watch fireworks and entertain themself at geisha parties on the houseboats called yakata-bune(屋形船) only during this period. Kagiya(鍵屋), a guild of pyrotechnicians, had set off fireworks from the first festival until suspension due to World War II. From 1810, Tamaya(玉屋), a branch of Kagiya, had taken its share of fireworks display. Tamaya was in higher repute than Kagiya, but Tamaya was expelled from Edo due to starting a fire. The festival has been held since 1978 after being suspended due to the worsening traffic situation from 1961 to 1977. Kagiya is still continuing its business. 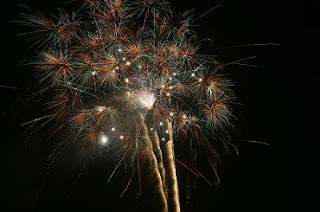 It's not in charge of the festival, but it sets off fireworks at another fireworks festivals. Tamaya is also continuing its business in Chiba Prefecture. Fireworks of the Edo Period has been reproduced. They are very different in the present. They are only orange in color and are unspectacular, but I get a warm friendly feeling from them. 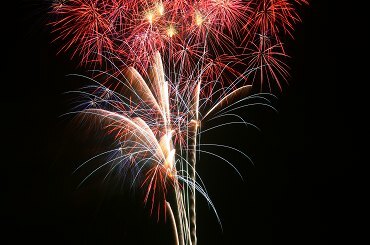 At the festival, a fireworks competition is held to improve pyrotechnicians' skills. 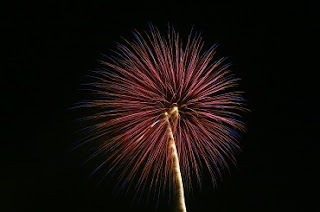 Japanese traditional fireworks form a perfect sphere in every single aspect. Its pyrotechnics was established in the latter half of the 19th century. I've watched the fireworks on the 24th floor of a high-rise building. Each of the fireworks was like a small ball. Fireworks festivals are held in summer at many other sites throughout Japan.